Schrapper’s understands that you like to look your best whether you’re working out, staying in or dressing up for an event. You like to have everything organized and at your fingertips so at a moment’s notice you can pull together any outfit for any occasion. 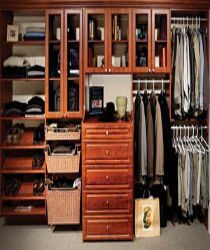 From housing your footwear to your hats – Schrapper’s has custom closet systems that work with you and your needs. Sit down with a design specialist and you will discover just how detailed Schrapper’s team of professionals is! Yes – Schrapper’s wants you to look your best each and every time you step foot out of your front door. Does Your Closet Need To Do Double Duty? Some people want a built-in closet system to serve as a home for all their accessories, while others want their cabinetry to perform double duty and act as a space that can be used to get dressed or to act as a sitting room. Regardless of what you need your closet system for – it needs to be adaptable and easy to use. To optimize your space, consider using a chair as a space to put your socks and shoes, for example. That way, you can hit two birds with one stone. Also consider where you will put the mirror; it should be about three feet away from where you will stand. In addition, keep in mind that when standing your view in the mirror should not be obstructed by a closet door.If you want to be able to iron items in your walk-in closet system, you could have a flip-down iron board installed on the back of a closet door. A television could also be installed in the walk-in closet, but you will need to make sure the TV is at eye-level or else it will not be used. Use a variety of components so that you have different heights to hang your clothes at. Do a stock-take on the types of clothes you wear, and make sure you have the right height for everything from collar shirts to summer dresses and blazers. 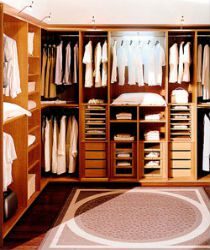 The interior of your closet should be lined with light colors. 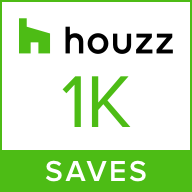 This can be contrasted with darker wood exteriors to give your wood closet system a unique color scheme. You can also have custom lighting installed to ensure you are able to find what you need inside your closet. 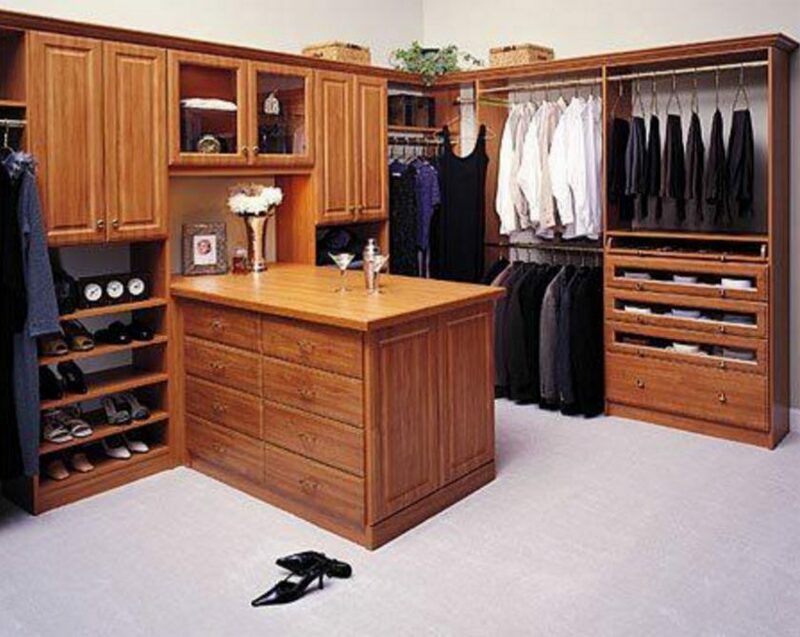 Why Schrapper’s Fine Cabinetry Inc. For The Design And Installation Of Your Closet System? It is a well-known fact that today’s customers spend more money on purchases while receiving less service. Schrapper’s Fine Cabinetry and Design is pioneering a new way – one customer at a time. At Schrapper’s, we make sure that our clients are armed with an arsenal of information, whether they hire us or someone else. Our goal is to make sure that your closet organizer system, walk-in closet or open closet brings your home to life. Contact us for more information today.